Roger Federer has done everything necessary to etch his name in the annals of tennis immortality and all that remains for the Swiss world number one is to add more grand slams to his remarkable tally of 15. Last season, Federer ticked the two remaining boxes on his career checklist when he won the French Open for the first time before breaking Pete Sampras's record of Grand Slam men's singles titles. His biggest challenge now is to maintain his motivation and while Federer insists he remains as keen as ever, the Australian Open could provide the first real glimpse into what lies ahead for his opponents. Federer has already won the Australian Open three times but is less dominant on the Melbourne Park synthetic hard courts than he is at Wimbledon and the US Open. By his own lofty standards, his early season form has been patchy. He was beaten by Swede Robin Soderling, for the first time, in Abu Dhabi then lost to Russia's Nikolay Davydenko in another warm-up event in Qatar. He then turned down the chance to play in the Kooyong Classic, an eight-man exhibition in Melbourne that he had used to fine-tune his preparations each time he won the Australian Open. 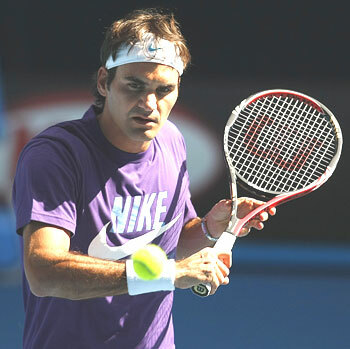 Despite his uncertain buildup, Federer remains the pre-tournament favourite. After all, he has made the final of 17 of the last 18 grand slams, dating back to Wimbledon in 2005. However, he was beaten in last year's Australian Open final by Rafa Nadal in a five-set classic and the Spaniard once again looms as his biggest obstacle. Nadal was on top of the world 12 months ago. He had beaten Federer in the finals at the French Open and Wimbledon in 2008 to spirit away the number one ranking then reduced the Swiss to tears by beating him at Melbourne Park. But in the blink of eye, the aggressive left-hander plummeted back down to earth from his lofty perch when his knees began to buckle and the injuries started to mount up. He took a break from the game and has not won any title since May. There were some encouraging signs when the world number two helped Spain win the Davis Cup last month then made last week's final in Qatar to give himself a confidence lift. "I am never going to say that I am going to win it. But I'm playing well enough to have a positive result. And I am happy," he said. 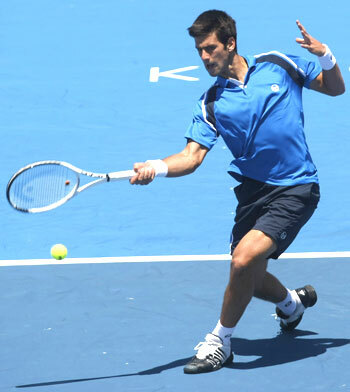 Serbia's Novak Djokovic won the Australian Open in 2008 to emerge as the most likely challenger to the Federer-Nadal duopoly but has failed to reach any Grand Slam final since. His Australian Open defence ended in the most disappointing fashion when he quit his quarter-final with Andy Roddick, complaining that he was exhausted by the heat, but he has vowed to make amends this time. "This year is quite different and I just hope it won't finish that way," the third seed said. 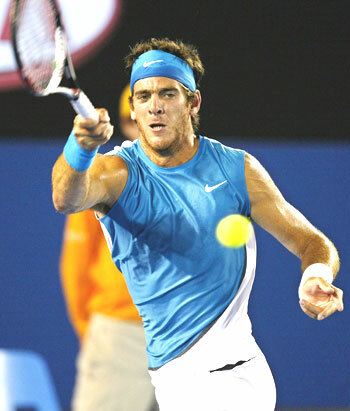 A new challenger emerged last year in the shape of Juan Martin del Potro, the giant Argentine who won the US Open, beating Federer in the final. The 21-year-old has been steadily improving over the past two seasons but his breakthrough win in New York was proof he is ready to mix it with the best and given him the confidence to set his sights even higher. "When I go to the court with Roger, Rafa, I don't feel too much different," he said. "That's important for the career, for the future, and of course if I want to fight for the number one," he added. The only other player in the top 10 who has won a Grand Slam is the American Andy Roddick, who won the US Open in 2003, but has lost all four finals he has played since, including Wimbledon last year. Roddick won the Australian Open junior title in 2000 and has been a semi-finalist in the senior event on four occasions but goes into Melbourne in great form after winning last week's Brisbane International. Andy Murray will again carry the weight of expectation of a British public starved of grand slam success. 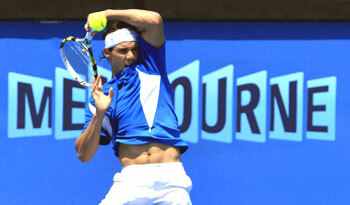 The Scotsman was one of the favourites to win the Australian Open last year but crashed out in the fourth round. He did reach the US Open final in 2008 and his early season form has been impressive, giving him renewed hope he can join the grand slam winners club. "I think I'm ready to win it," Murray said. "I just need to play well, if I do that then there's no reason why I can't."